Good Monday Morning to ya!! I hope you had a wonderful and blessed Thanksgiving! Personally, I'm glad Monday is here! I had 2 Thanksgivings and lots of leftovers, and my body is not too happy with me! I wouldn't say I overdid it, but I did eat more than I normally do. It sure was delicious though! I hate that stuffed feeling you get after eating too much, and I experienced that a couple times! That feeling just brought back memories from when I used to feel stuffed from eating too much all the time. It's miserable, and I will never go back! I did run 5 miles on Thursday, for a total of 14 for the week. Which is not good, since I usually run 25. But, today is a new day and I'm back to eating healthy, running and strength training! For the first time in 5 years, even though I swore I would never do it again...I went Black Friday shopping. My bff, Christie, talked me into it! We went from 11 pm-4 am, Thursday night. We went to a couple places, but Kohl's was my jackpot! I got a LOT of clothes (including some running clothes!) for over half off! We only had to stand in the check out line for an hour and a half. That was crazy! But, at least we were together, so that made it much easier! I also liked going at that time, rather than waking up at 5 am and shopping all day. So, I think this will become a tradition for us...something I NEVER thought I'd say!! Last night I put up our Christmas tree! For some reason, this is something I always do alone. My honey carry's all the boxes up for me, but then he just likes to watch me decorate! And my boys have no interest in hanging ornaments either. Maybe it's a teenager thing! Do you like the criss-crossed ribbon? Thank you, Pinterest! Manny decided to take a nap on my ribbon! 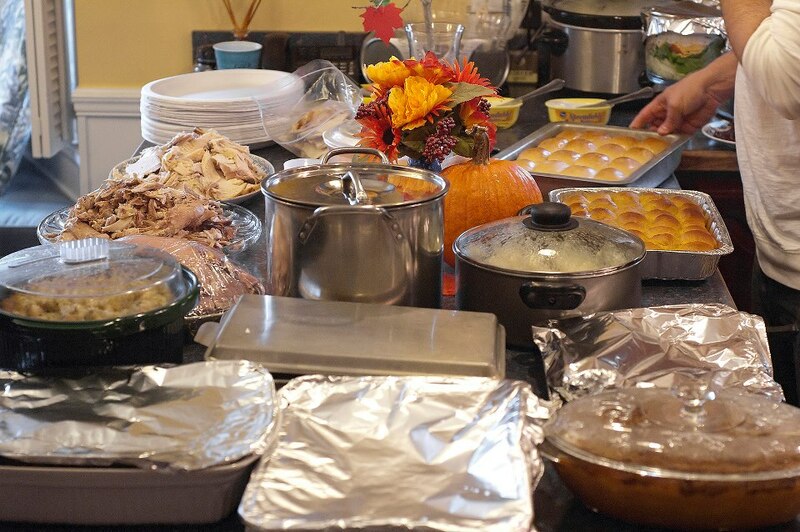 QOTD: How was your Thanksgiving? Did you go BF shopping and get any good deals? Looks like fun!! I LOVE the criss-crossed ribbon! I hope to get a live tree next year, I've only had artificial ones! I'm one that doesn't mind Black Friday sales or Boxing day stuff! I kinda love the excitement in the air with all the people! Awww, thanks! There definitely was excitement in the air. It wasn't nearly as bad as I was expecting! I'm with you on all that Thanksgiving food- I didn't stuff myself like I used to, but I definitely did not eat like I usually do!! Getting back on track today!! Uh-huh!! I have only been BF shopping once and I'm pretty sure I will NEVER do it again. I pretty much cannot stand and wait in any line of any kind, so it's not the best fit for me and my lack of patience!! Getting back on track feels so good!! That's what I used to say about BF too, but maybe you should give it another chance! ;) If I had been alone, I never could've stood in line for an hour and a half, but being with someone makes it much easier! My Thanksgiving was so different than usual this year and since I had to cook I didn't over eat, except on pie! Pecan pie... oh so good! Your spread looks like it was pretty awesome! And I, too, had a very low running milege week which felt strange, especially after stuffing myself with pie ;) Very cute ribbon idea! How'd you do it?? Oh, I love pecan pie! I wasn't really happen with how the ribbon turned out. Her picture was so much prettier! I draped LONG pieces of ribbon over the tree, then you just hook them together, I used ornament hooks. You hook them together where they make diamond shapes. It's kind of complicated and took hours! I don't know if I'll do it again! Your tree look so pretty. I ate too much this past weekend. I did good with all the Thanksgiving food but way overboard on the sweets!!!! Today was much better so I hope I am back on track! Thanks, Teresa! Sweets are my weakness too. It sure feels good to be back on track! I love your tree! I am jealous of everyone and there trees I can't have one. Are you an elfforhealth? Awww, why can't you have a tree? No, I'm not, I read about it though. Should I be? Love the ribbon!! I am sad in away that I will not have a tree this year. I only allow real trees in the house and we are going on vacation from 12/24 to 12/31 so a tree would die and probably set my house on fire...LOL But I will be in Belize so I can complain too much right? I LOVE the criss cross ribbon! Very cool. Black Friday shopping is always a crazy adventure! Glad you guys had each other so you didn't get bored in line. 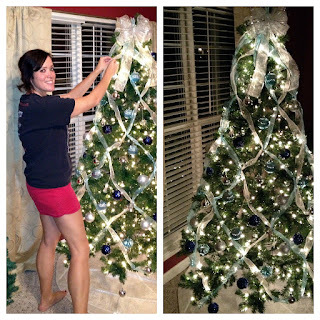 Your tree looks great with the ribbon! Looks like you had a wonderful Thanksgiving girl! Sure thing! I love decorating! It was great, hope you did too!